So, what do you do with a prostitute? 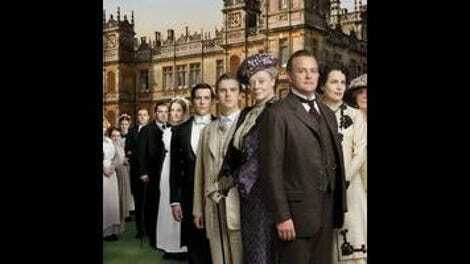 That question dominates most of tonight’s Downton Abbey. The sideshow with Ethel and Mrs. Crawley finally comes to the forefront as the men in the big house learn a former streetwalker is cooking luncheon for the Crawley women. Ethel’s storyline has lacked some punch this season—though I generally like her and sympathize with her, we’re rarely shown the depths of her despair or the self-loathing that she experiences. But I do like the way she handles herself in this episode, even standing up to Lord Grantham in the episode’s most climactic moment. But the strongest player in this episode comes from below-stairs—unexpectedly, from Mrs. Patmore! Because she’s the one that starts all the trouble in the first place. Carson forbids anyone from helping Ethel, but Mrs. Patmore defies orders to give Ethel a few recipes. It does wonders—it’s legitimately heartwarming to see Ethel so happy about her creations, so eager and excited to serve something worth eating for once. Nearly everyone in the episode is offered an opportunity to express their opinion on reformed prostitutes, which is an interesting spine to build the episode around. Mrs. Patmore starts out by wordlessly advocating kindness, which more or less sets the stage for nearly everyone else in the show to follow her example. One of my favorite things about Downton Abbey is how it demonstrates the power of change that occurs in parlor-rooms. Epic war and total revolution are splashy ways to get the job done, but ultimately, the changes that affect our social fabric the most tend to occur incrementally, over the course of months and years, in the places we call home. Over the course of now three seasons, Downton Abbey has been showing us those changes—that, for example, a man with a limp can still be an able valet, or that a woman with a disreputable scandal in her past can still find love. That the chauffeur can also be a son-in-law, that the daughter can also write letters to the editor. This is a world on the cusp of transformation. Of course, the person who benefits the most from the status quo is going to be the most traumatized by the idea of change. So Lord Grantham spends this episode moving from one panic attack to the next, unable to handle the news that Matthew wants to change the way he’s been managing the estate, and then that his first grandchild may very well be raised Catholic, and that his second daughter is interested in pursuing a career in newspapers, oh and that his daughter might have died because he put a little too much faith in the patriarchy. Add a disgraced housemaid to that list, and Robert Crawley is all set to blow a gasket. 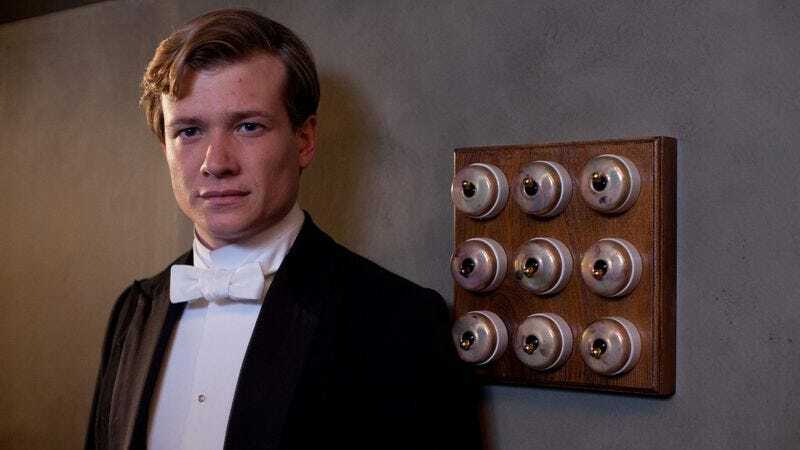 So he storms down to Downton Village, having been tipped off by Carson that the ladies are being exposed to scandal over a quiet sympathy lunch, and bursts into the small dining room, startling the hell out of everybody, who are decked out in full mourning, eating salmon mousse. Robert angrily orders everyone to leave. The assembled retinue of women who are related to him—his two daughters, his wife, his mother, and his mother-in-law/cousin—are surprised by his entrance, and surprised to learn their cook was once a prostitute (I mean, wouldn’t we all be?). But then, one by one, they remain seated, ignoring his grandiose pronouncements about dignity and reputation. It’s a quiet, unremarkable stand against authority, but it is strong, and kind of beautiful. Perhaps everyone’s reasons for standing up to him are a little haphazardly defined—it seems to be more personal than political, especially for Cora—but the general attitude is the same: Robert, shut up. (If even the Dowager Countess of Grantham is raising her eyebrows at your scruples, you’ve got to be doing something wrong.) The strongest emotional punch is when Ethel herself comes out of the kitchen, balancing a dessert on a tray, smiling at her own abilities. Robert looks at her and he can’t say his protestations to her face, because that’s exactly how ludicrous they are. Did I revel a bit in his dressing-down? Absolutely. This moment has been a long time coming for Robert. This season’s demonstrated him at his worst. But it’s also terrible—his daughter just died, horribly, and he blames himself (though not as much as Cora blames him, probably). The moment he shares with Mary in the library captured that really well. I also liked her response to him, when he accuses her of being on Branson’s side: “I’m always on your side. But you’ve lost on this one.” Mary and Robert have always had an interesting bond—something that last year’s Christmas special developed, too. It’s always seemed like Mary and Robert have a special bond, a shared concern for the family and its status that is quite different from anyone else in their family (and probably only shared with Carson—an unlikely triumverate). The tension of the first and second seasons is in large part due to Mary’s inability to face what she feels her father might feel about her indiscretions; his forgiveness, in the Christmas special, gives her the validation she needs to leave Richard and marry Matthew. And it seems in this episode like she’s trying to give him the option to be practical, and not be quite such a stick in the mud. It remains to be seen if he’s really going to take that option, as the episode didn’t resolve the major questions. Pretty much everything that revolves around the central theme of Robert’s dignity works very well—his crisp, biting conversations around breakfast with Matthew, Branson, and Edith bring out pithy, terrible statements from him (mostly about Catholics). All of this talk about religion results in a strained conversation over the dinner table where Downton’s parish priest joins the family in spirited debate about religion. (Conclusions: God loves Catholics, but not as much as he loves Anglicans, who are doing God’s word in bringing Christianity to the heathens in India by colonizing them. Hooray, Anglicans!) But I felt a little strange about the way his problems with Cora are resolved. It’s not beyond the Dowager to manipulate Clarkson and Cora a little for what she sees as the greater good, but I find it interesting that it seems like the audience is supposed to be unperturbed by her actions. And why not extend the conflict between Cora and Robert? Surely if Julian Fellowes is looking for plot developments (and he always is) that would have been an interesting one. Still, considering my skepticism about Ethel’s continued presence in the show, this episode provides an opportunity to enjoy what she brings to it. Speaking of quiet revolutions, Branson’s place in the Crawley family is intriguingly tenuous now. He came into this house as a working-class socialist, and he’s currently eating at table on fine china, with an aristocrat daughter to feed and educate. This episode began to get into that a little, but I’m interested to see how this plot resolves, if only because perhaps he’ll learn that parlor-room revolutions are the best way to spread his message. My only concern with this episode is that it’s not very engaging. It’s good, but the plot moves slowly, and there are a few digressions that are presumably leading to something big but don’t have much of a payoff. There are still some crucial questions about narrative and pacing to bring to Downton Abbey, but we can save those for an episode that isn’t airing opposite the Superbowl Blackout. Above when I was trying to write about the Crawley family I got rather upset that there are now only two daughters, instead of three. Poor Sybil. And what do you think about Branson deciding to name his daughter Sybil? “Gruesome,” as Lord Grantham has it, or reverent, as Mary and Branson himself seem to think? I’m glad that even though Carson and Mrs. Hughes disagree on Ethel, they acknowledge that they’re basically an old married couple. Oh right, so Bates is free! Um, I don’t know how I feel about this just yet. If anything, I’m more convinced than ever that Bates is violent and not to be trusted, even if he didn’t kill his wife. I do think the ladies’ maid dress is hella unflattering on Anna, though. It seems pretty out of character for Thomas to just be feeling up any old cute boy in the vicinity, especially as his sexuality has gotten him into so much trouble before.